Tomorrow morning in Fremont, Nebraska welcomes in the 2nd annual Midland Greco Exhibition Series, held in concert with the Midland University Lady Open. Last year, all of the athletes in attendance (ranging from Schoolboy all the way up to Senior) combined to receive over 100 matches. That looks to be the case again tomorrow, or certainly close to it, as another solid turnout is beginning to take shape. One item of note is that a purported dual meet featuring Williams Baptist College versus another squad has not materialized for this evening. 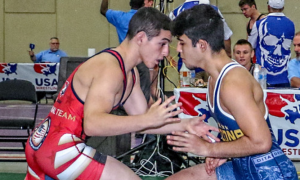 It was a goal of the Midland organizers, primarily MWC assistant Zack Wilcox and Nebraska official/Olympic styles advocate Cody Goessl, to put together an all-Junior dual to serve as a kind of appetizer for the main event tomorrow. But with logistics and personnel issues still developing as the morning approaches, it was unable to come to fruition. Home club MWC is going to be well-represented and sees three of its age-group stars gearing up for battle on Saturday morning. 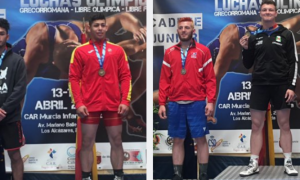 And not-so-coincidentally, all three wrestlers have experienced a taste of success overseas — Nate Rubino (54 kg), Conor Knopick (58 kg), and Camden Russell (59 kg). 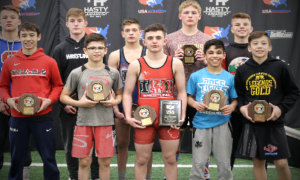 Russell impressed on the 2017 Go Greco USA Developmental Tour by earning a medal in Croatia. 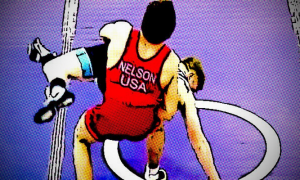 This past season, he one-upped himself by grabbing gold at the Austrian Open. Rubino and Knopick both stole headlines earlier this year, as well. Rubino struck first by winning Serbia’s Refik Memišević-Brale Tournament. 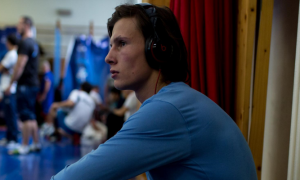 A week later at the Croatia Open, he snared his second straight gold and Knopick dominantly mowed down four opponents to collect his first international title. 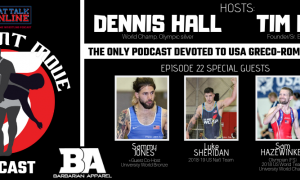 Legends of Gold, the US’ grand full-time training facility headquartered in South Dakota, has brought just under two dozen athletes to Nebraska. MWC had its group of wrestlers check in for some international training and competition this year, but so too did LOG. The Easter Wrestling Tournament in Holland back in April saw LOG age-groupers earn a whole bunch of hardware. Several of those medalists will be banging it out on Saturday, including Trason Oehme (42 kg), Kellyn March (60 kg), and Adam Allard (60 kg). 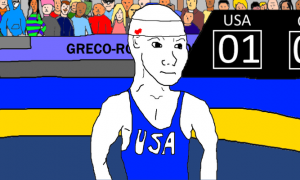 WBC Greco athletes who appeared in this event last year wound up not seeing any competition time again until the spring. But when they got back out on the mat, there were a few who made sizable impressions. Heavyweight Conor Karwath held his own against just about everyone he faced and came away with a huge pin over Marine Trent Osnes. Devon Amburgy (97 kg), who like Karwath is still in need of experience, demonstrated an eager preference for throws and looks to become an offensive force as he continues to develop. Though more understated, Timothy Eubanks (87 kg) is another of Williams Baptist’s prospects who could wind up maturing into a dangerous Senior-level threat. But it is Anthony King (55 kg) most observers will likely have their eyes fixed on tomorrow. King, the Illinois star and Fargo fan-favorite, is making his official debut for Williams Baptist at the Midland Exhibition Series and is surely going to be walking into each match with a target on his back.